There are six basic theoretical concepts of the Kinesio Taping technique called corrections. They are: mechanical, fascia (fascial), space, ligament/tendon, functional, and circulatory/ lymphatic. Mechanical corrections are used for improved stability and biomechanics. Fascia or fascial corrections create or direct movement of fascia. Space corrections are used for decreasing pressure over a target tissue. Tendon/ligament corrections decrease stress on a ligament or tendon. Functional corrections provide sensory stimulation to either assist or limit a motion. Circulatory/lymphatic corrections help move lymphatic fluid from more congested to less congested areas. 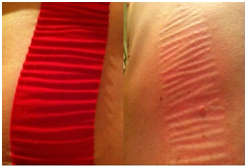 Kinesio Taping has also been shown to affect scars. Reductions of adhesions and pitting, softening, flattening, improved pliability and reduction of contractures have been seen in some patients often within 24 hours of tape application to the skin. Fundamentally tape causes a form of decompression between the skin and the tissue underneath. When an elastic membrane (tape) is applied to another elastic material (skin) the result is often a series of wrinkles in both the tape and the skin. These wrinkles don’t always appear and aren't necessary for tape to work. But they do make a good visual example of the mechanism by which the elastic qualities if kinesiology tape induces a decompressive effect between skin and the tissue under it. The elastic properties of tape induce a vertical lift of skin (via the formation of wrinkles) from the underlying tissue. This decompresses the space between skin and muscle. This space (subcutaneous space) contains lots of important stuff like nerve ending, blood vessels, etc. This decompression promotes improved blood and lymphatic flow into and out of the taped area. This allows the more rapid removal of injury waste products and pain generating chemicals, and promotes healing. Tape has longitudinal stretch properties of about 140-180%. These stretch properties are similar to those of skin, muscle and connective tissue. This helps the body’s stabilization system by adding a little extra stability, spring and awareness of stretch to muscles, ligaments, tendons joints, etc. It may also have a role in restoring normal slide and glide mechanics between layers of tissue. The presence of tape on the skin helps to create a non-painful stimulus from the area this makes it more difficult for the nervous to feel pain in that area (Pain Gate Theory). The decompressive properties of the tape (think wrinkles) reduce pressure and compression on nerve endings just under the skin making them fire less. Tape placed over really tight muscles seems to reduce the response to being stretched, making them feel less tight and sore. Tape placed over weak, sore and injured tissue will act to aid the bodies ‘active’ stabilization by altering the activity and feedback from nerves in the skin and underlying tissue. Its not a miracle cure. It won’t mend broken bones or instantly fix serious injury. It doesn’t work like a plaster on a wound. To get maximum effect, the right combination of tape and tissue stretch is vital.